Take the helm for a thrilling family holiday at the Pirates Village! This pirate themed hotel is endlessly fascinating as you enter a fantastical world of fortresses, caverns and waterfalls. Here any aspiring pirate will feel like a bounding buccaneer as they take part in pirate games and protect the pool when pirates attack! Plus, with the weekly pirate show providing action-packed fights, lights and fireworks even grown-ups won’t fail to be impressed. 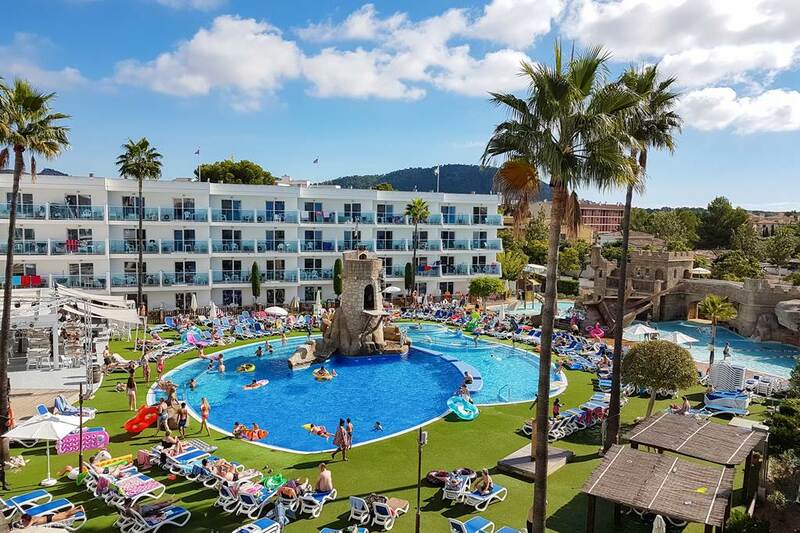 When it comes to dining, take your pick from great value Self Catering and enjoy the nearby bars and restaurants or go ‘overboard’ with All Inclusive and enjoy a feast of food and drink fit for a captain. So what are you waiting for, become a pirate, give the kids an unforgettable holiday and unleash your inner child at the Pirates Village! The All Inclusive package includes buffet-style breakfast, lunch and dinner in the main restaurant. Snacks including ice cream are available at selected times between meals for a minimum of 3hrs per day. Local wine, beer, spirits, cocktails and non-alcoholic drinks are available until 23:00. Buffet. Serves breakfast, lunch and dinner with show cooking. Kids buffet available. Outdoor freshwater pool with slides and children's section. Sunbathing area with sunbeds and parasols. Splash park - tipping water bucket, sprinklers and waterfall. Daily evening entertainment including in-house entertainment shows, karaoke, live music, mini-disco and professional shows. Children's club (3-12yrs) - arts and crafts, small team games, sports, movie nights and drama and music (open between 03 Apr and 31 Oct, between 10.00am and 5.30pm, depending on occupancy). Children staying on Self Catering can eat for free at the children's club. Reception - equipment for hire includes motorised scooter*, pushchair* and wheelchair*. Services available include currency exchange, English newspapers* and luggage storage. This place is great for a family holiday. Food was great on the all inclusive, kids had a steady flow of icecream, water or assortment of juices. Pools are great, different depths on one side and toddler zones on other. The pirate theme was great. The staff that deal with the children have the patience of a saint. We had a brilliant week at the pirates village, our room was lovely and we had plenty of space for the 5 of us and we found the bed to be very comfy.The entertainment was brilliant and the entertainment team were always on the go and were very friendly, as were all the staff in the hotel.My girls loved the swimming pool area even though the water was freezing!! !The food was ok, we enjoyed the breakfast and food from the snack bar the most but there was something for everyone. The shops and restraunts outside the hotel are right on your doorstep and the beautiful beach is just down the road.Brilliant hotel for families. Omg. From the time you arrive to the time you go home. Fantastic service. Loads of entertainment and things to join in with. Room was cleaned daily and fresh towels left. Staff made it and the theme couldn't ask for more. Would suggest doing all inclusive as saves a lot of money. Only gave 4 stars as food needs to change every other day. Got boring after a week of nearly same food. But does have a wide selection. The Hotel was very good except the rooms. Very basic not comfortable. Not enough towels had to ask for more. The service was good.Entertainment and The pool area was excellent. Overall the holiday was good. a hotel close to a great beach. Food plentiful and varied of good quality. staff very helpful and kids entertainers and clubs superb. pool facilities again great for kids and adults alike. hotel mostly clean and tidy. All inclusive deal good value. only down point, rooms very dated and in need of updating, when more than a family of three, the extra put me up beds are not suitable for adults of elder children and certainly not comfortable for more than 1 night. we endured them for 7 and that was more than enough.